– 3 swappable’ seat and pedal assemblies with different length carbon fibre elements with integrated pedals and saddle. – A drivetrain concept that is oil-free and low maintenance. – Integrated braking mounts at the rear of the rickshaw for safer braking. – A drivetrain differential to allow both rear wheels to be driven, improving traction for hill starts, enabling the rickshaw to take tighter corners and enhancing ride with improved handling and safety. – Integrated lighting, internal brake and gear shift cables, novel drive belt tensioner, mudguards, USB charging and Ultimate Ears MEGABOOM McLaren MCL33 Edition speakers. Another amazing set of kids inspiring all of us with their courage and determination to complete a challenge against all odds. The Across the Divide Team have created another awesome challenging route for the rider worthy of your sponsorship and World Extreme Medicine is supporting the big event with medical backup. This also marks the occasion where Across the Divide well surpasses £100 million raised for charities making 2018 a very special year for us indeed – what a great achievement for the entire team! 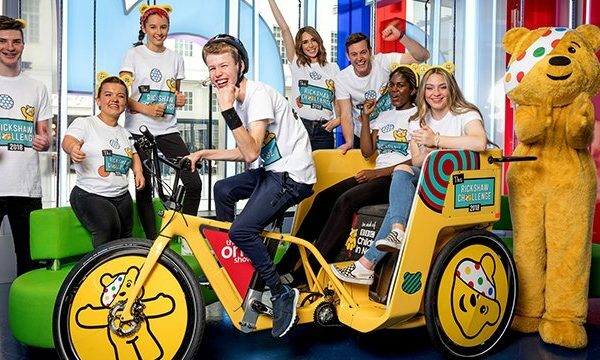 ‘Now entering its eighth year, The Rickshaw Challenge sees young people supported by the British charity ride more than 400 miles over eight days. Starting on Friday, November 9, the riders will set off from Calais, pedal 31 miles through the Channel Tunnel, before heading north through England and Wales towards the finish line at BBC Media City, Manchester. You will be able to follow their rickshaws progress at the pudsey.viewranger.com.